Baker/Brown-Type packer elements are essential elastomeric down-hole devices employed in a wide assortment of oilfield applications — including well completions and short-term seals. However, because many of today’s oil and gas explorations are going further and deeper to meet production quotas, the need for Baker/Brown-Type packer elements to perform well has never been so important. With so much riding on the safe, consistent performance of wells and rigs, oilfield workers know they need to count on the packer elements they use to work right the first time around — whether they’re completing a well or preparing it for some type of injection or treatment. From increased depths and elevated temperatures to deep water and extended reach scenarios, using packer elements to form reliable seals with casings and liner walls is an integral part of running a secure, profitable operation. The good news is that when you choose Global Elastomeric Products, Inc. as your supplier of rubber molded products — including Baker/Brown-Type packer elements — you’re getting more than 50 years of experience and engineering know-how behind every elastomeric product and oilfield replacement part you order. Baker/Brown-Type packer elements are rubber seals that operate under specific down-hole conditions and provide a seal for either short-term or long-term completion. 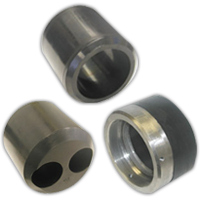 Global EEE has an expanding line of packer elements for your tool and well conditions. Our selection of Baker/Brown type packer elements is extensive, with standard sizes ranging from 4 1/2” all the way up to 13 3/8”. Global EEE has the ability to mold and manufacture any rubber compound. From traditional Nitrile and EPDM products, to your Viton’s, Aflas, FKM’s, Global EEE has the knowledge and resources to manufacture any of your custom element needs. Call us at 661-831-5380 for your custom project and we can walk you through the design to manufacturing process. Our knowledgeable in-house design and engineering team are just another reason you can trust all our American-made products to perform at a superior level. In addition, because we’re an ISO 9001:2008-registered company, our stringent quality control processes mean every product you order from us is guaranteed to be free of defects. For more information and a no-obligation quote on any of our Baker/Brown-Type packer elements, feel free to contact us today.